PHILADELPHIA, PA – September 5, 2017– Janney Montgomery Scott LLC (“Janney”), a leading full-service wealth management, financial services, and investment banking firm headquartered in Philadelphia, PA, today announced that John T. Hardiman and William E. Lepping have joined Janney’s Melville, NY branch office. 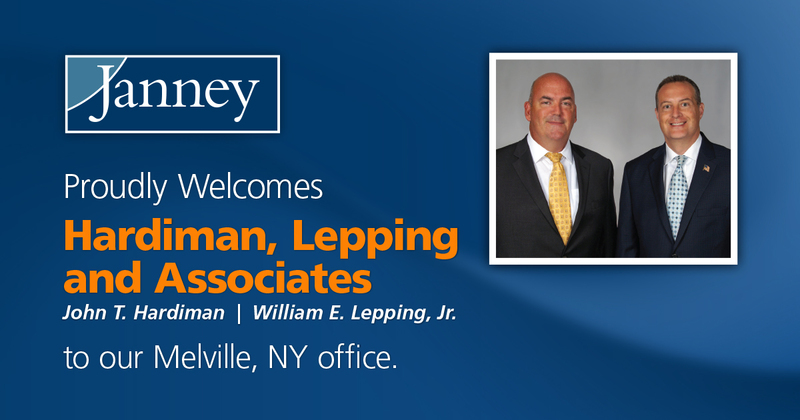 Hardiman and Lepping were previously affiliated with Merrill Lynch. Hardiman and Lepping each have over twenty years of financial services experience. Hardiman graduated from St. John’s University in New York, receiving both a BS and MBA in portfolio finance, and serves as a board member for a non-profit special needs school as well as being a volunteer fireman and EMT. Lepping graduated from State University of New York at Oneonta and is an active member of the US Power Squadron. Janney’s Melville, NY branch office is located at 324 S. Service Road, Suite 100, Melville, NY 11747.